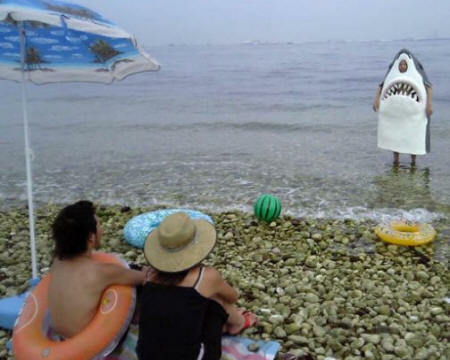 Unless you live under a rock, you're probably aware that this past week was Shark Week on the Discovery Channel. It's an annual thing - basically the Discovery Channel shows the same footage they've shown for years - everything you've ever wanted to know about sharks, but with a different host...I guess to make it more watchable. Much of the stuff is available online, and some of it is on Netflix. There are a lot of shark movies out there, too. Jaws is probably the best, but there are a number of copy-cats, and an even larger number of "monster" flicks. Most of these films are only really enjoyable because of their bad bad bad scripts and their worse special effects. There are some things I guess one just can't get enough of, and for me it's the awful special effects. But Jaws is the classic - giant shark, blood, dramatic music. It's magical. And in honor of shark week, I'm re-posting my comments on the book that started it all. In his 2005 introduction to Jaws (1974), author Peter Benchley makes a very valid point in saying that he could not possibly write Jaws today. His reasoning has much to do with the current global standpoint on conservation and appreciation. It's true - the world has a very different perspective on Sharks than it did in the early 70s. But Benchley and his novel had had a lot to do with that shift and, if he hadn't written it, someone else would have. Perhaps that's why it doesn't seem as scary to me as it should. There are too many movies, documentaries, etc. on great whites and other sharks to make this novel very frightening. I've seen all four Jaws films...I own all four films in the franchise. I'm also a proud owner of the Italian rip-off of the original film (The Last Shark, aka L'ultimo Squalo). I've seen Shark Attack and its two sequels. I've even seen Debbie Gibson in the never should have been made Mega Shark vs. Giant Octopus. But what am I afraid of in the ocean? Not the big sharks, no. I never go out far enough to be scared by the big sharks. I'm afraid of stepping on jelly fish and anenomes, urchins and horseshoe crabs. I'm more afraid of having to have someone pee on my leg than I am of actually losing that leg. Although that's not wholly true -- I do find myself quite fearful of bull sharks and other sharks that, through the education of Discovery Channel's Shark Week, I know like shallow water, which is where I hang out. Benchley also goes on to say that of course the novel is not the film - the book he wrote was well-rounded, with a quiet understanding of the socio-economic undercurrents as well as a relatively solid grasp on female emotion, while the film (albeit BRILLIANT) was about a big shark. And while I already knew most of the changes made for the film, it was a treat to go back and see what the story was before it was the first summer blockbuster, and how those exclusions contributed to making it such a hit.